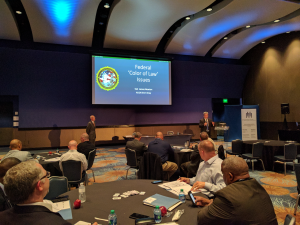 On Thursday, April 20 and Friday, April 21, 2017, the Auschwitz Institute for Peace and Reconciliation (AIPR) held the inaugural National Seminar for Law Enforcement on Civil and Human Rights Protection in Atlanta, Georgia. 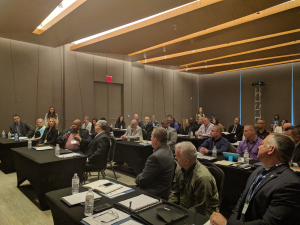 The event, co-organized by the National Center for Civil and Human Rights and the U.S. Federal Bureau of Investigation, welcomed 20 police officers from departments across the eastern U.S. to the National Center for a two-day training seminar. For the Auschwitz Institute, the seminar served as an opportunity to use the lessons it has learned from extensive work in the international realm of atrocity prevention in order to help build capacity within our law enforcement partners in the U.S. to detect relevant risk factors for identity-based marginalization and violence, identify appropriate response tools, and recognize best practices to foster resiliency in targeted communities. The unique purview and setting of the National Center for Civil and Human Rights contributed to a constructive learning environment, allowing participants to fully immerse themselves into the topics and themes covered during the event. The seminar was carried out with three principal goals in mind: first, the program worked to familiarize participants with the concepts of genocide and other mass atrocities and examine the factors which put societies at risk for these crimes. Second, it emphasized the ways in which the protection of human and civil rights by law enforcement plays a role in the prevention of mass atrocities. Finally, the seminar worked to assess the role law enforcement can play in the prevention of mass atrocities and to apply those lessons to the challenges facing police today in serving multicultural communities. The first day of the event began with opening remarks from Ms. Samantha Capicotto, AIPR’s Director of Policy and Planning, Ms. Nicole Moore, Manager of Education and Museum Content at the National Center for Civil and Human Rights, Dr. Tibi Galis, Executive Director of AIPR, Mr. Matthew Alcoke, Assistant Special Agent in Charge (ASAC) at the Atlanta Field Office of the Federal Bureau of Investigation (FBI), and by Dr. James Waller, AIPR’s Director of Academic Programs. 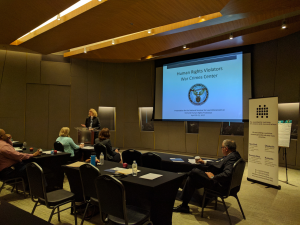 After his introductory remarks, Dr. Waller continued with the seminar’s first module, which introduced attendees to core concepts related to genocide and mass atrocities as well as the important risk factors involved in the processes of these crimes. 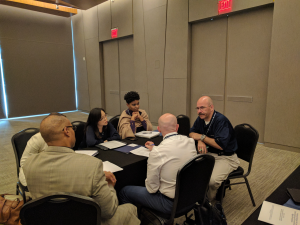 Following this session, participants were given a comprehensive guided tour of the National Center for Civil and Human Rights, including its permanent exhibits on the movements for American Civil Rights and Global Human Rights. A debriefing session for attendees was held immediately following the tour, giving them a chance to reflect on what they saw and experienced, as well as contextualizing the content of the exhibitions within the seminar’s broader goals. Dr. Waller then delivered his signature “Becoming Evil” module before the day was concluded with a presentation on the mandate and work of the Human Rights Violators and War Crimes Center by Supervisory Special Agent (SSA) Kerry Sparks and Intelligence Analyst Kristen Acton from the FBI’s International Human Rights Unit along with Dr. Ann Schneider, a historian working for U.S. Immigration and Customs Enforcement. After a short set of initial observations by Dr. Waller, the second day of the program began with a Keynote Address by Mr. Charles H. Ramsey, former Philadelphia Police Commissioner and Co-Chair of President Obama’s Task Force on 21st Century Policing. Mr. Ramsey’s remarks focused on the experiences and lessons he learned throughout his formidable career in law enforcement, ranging from the moment that he was introduced to policing as a profession through his time helping to lead the Task Force. He also discussed the transformative experience of his engagement with histories and survivors of the Holocaust and how these lessons informed the development of his perspective on policing in a democratic society. Presenting next was Dr. Cedric L. Alexander, the current Deputy Mayor of the City of Rochester, New York who also served on President Obama’s Task Force alongside Mr. Ramsey. 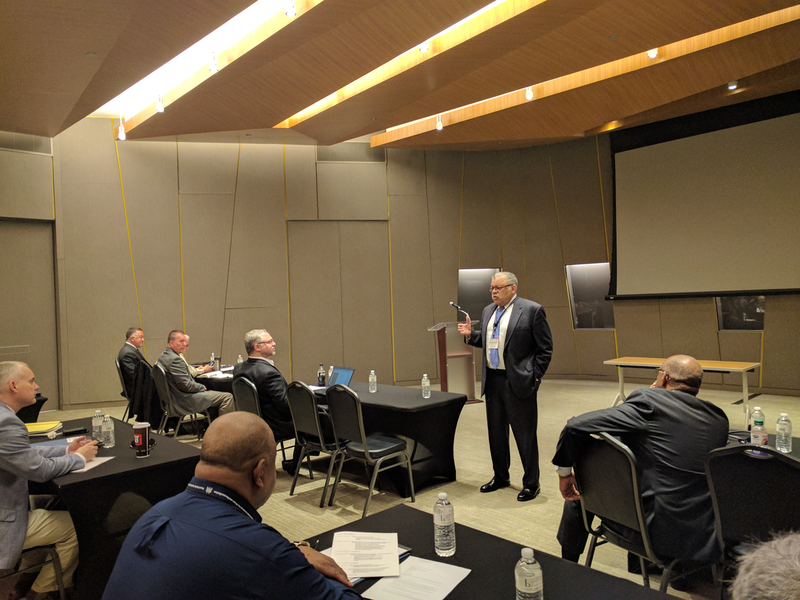 Dr. Alexander spoke with attendees about the challenges of policing in contemporary multicultural communities, including many of his own experiences as Chief of Police in Rochester as well as Deputy Chief Operating Officer for Public Safety in DeKalb County, Georgia. His module included an interactive component, which allowed participating officers to discuss and share ways in which their departments are working to form stronger relationships with the citizens and communities they serve and, thus, better respond to the needs of those specific populations. The seminar’s final module was conducted by Supervisory Special Agent James A. Newton from the FBI’s Civil Rights Unit alongside Mr. Brent A. Gray, Assistant U.S. Attorney with the U.S. Department of Justice. SSA Newton and Mr. Gray delivered an interactive presentation on federal “Color of Law” investigations, including robust coverage of the legal concepts involved as well as the ways in which this statute has historically been invoked to prosecute offending government actors. 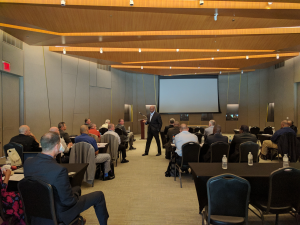 The presentation also outlined the relevant offices, bureaus, and institutions of the Department of Justice and how they interface with the work of police officers around the country. The Auschwitz Institute is proud to have contributed to the first edition of our National Seminar for Law Enforcement on Civil and Human Rights Protection, conducted in collaboration with the National Center for Civil and Human Rights and the FBI. The commitment and initiative shown by the attending officers in engaging with the presented material and contributing to the discussions held throughout the event was both impressive and deeply encouraging. 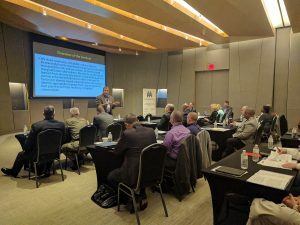 This, combined with the positive preliminary feedback that we have received from the participants, goes a long way in demonstrating the need for initiatives like this to expand the understanding of law enforcement’s role in the prevention of atrocities, especially when considering the volatile nature of today’s social climate in the U.S.